PFF experts use our exclusive player data and signature stats to project player performances for fantasy and DFS games. The fantasy football waiver wire can often make or break your season. Making the right decision on which players to add and drop is crucial, so we have you set up with a deep list of potential waiver wire adds for Week 6. Remember, we cast a wide net every week in our waiver wire advice. Below you’ll see recommendations for shallow, regular, and deep leagues. Players are listed in order of priority and the suggested auction budget percentage is in parentheses. Keep in mind that some leagues may be more aggressive or conservative in terms of bidding, so know your league tendencies. Regardless of the size of your league, it’s suggested that you work your way down the list and prioritize the top players in your waiver claims for this week. Jameis Winston, TB (5-10%) — The Bucs return from bye with Winston under center. He’s far from a lock for QB1 numbers, but he certainly offers upside going forward with all of the weapons in Tampa. Corey Clement, PHI (25%) — With Jay Ajayi landing on injured reserve, Clement is in position to assume the lead back duties once fully healthy for the Eagles. Isaiah Crowell, NYJ (25%) — Don’t expect long touchdowns every week, but Crowell is worth scooping up in the 19% of leagues where he’s still available. Keke Coutee, HOU (15-30%) — The rookie wideout is coming off another strong performance after finding the end zone in Week 5. Marquez Valdes-Scantling, GB (12-25%) — With Randall Cobb and Geronimo Allison sidelined, Valdes-Scantling saw 10 targets and put one of them in the end zone last week. Greg Olsen, CAR (25-50%) — Initially, it looked like Olsen was going to miss significant time with a foot injury. But he’s on track to return this week and is available in 40% of leagues. Blake Bortles, JAX (5%) — It isn’t pretty, but Bortles is getting it done for fantasy purposes. He’s 10th among quarterbacks in fantasy scoring so far this season. Eli Manning, NYG (3-5%) — The Giants showed signs of life on the offensive side of the ball in Week 5, but keep in mind that Manning is at best a bye-week fill-in. Baker Mayfield, CLV (3-5%) — Mayfield didn’t put up big fantasy numbers last week, but the rookie held his own against a tough Ravens defense. Wendell Smallwood, PHI (15-20%) — Corey Clement is the preferred Eagles running back add this week, but Smallwood will also have value going forward with Jay Ajayi on injured reserve. 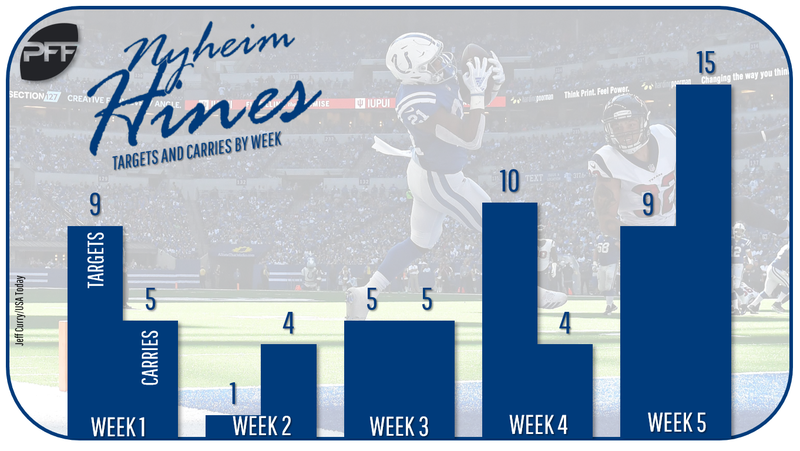 Nyheim Hines, IND (15-20%) — Hines topped 20 touches and saw 15 carries against the Patriots in Week 5. He’s shaping up to be the Colts lead back moving forward. Alfred Morris, SF (10-15%) — With Matt Breida banged up, Morris is in store for a healthy workload over the next two weeks. He doesn’t offer major upside, but the volume will be there. Bilal Powell, NYJ (10-15%) — While Isaiah Crowell put up big yardage numbers last week, Powell actually led the team with 20 carries. Mike Davis, SEA (7-10%) — The Seahawks appear to be deploying a two-man committee of Chris Carson and Davis in the backfield making Davis worthy of a bench spot in regular-sized leagues. Robby Anderson, NYJ (10-20%) — Yes, he scored two long touchdowns, but Anderson saw just three targets in Week 5. Be careful to not overspend for him. Chester Rogers, IND (7-15%) — Rogers has racked up 11 targets and eight catches in each of the Colts’ last two games. That sort of volume bodes well for fantasy purposes going forward. Mohamed Sanu, ATL (7-15%) — We know he doesn’t have the highest ceiling, but over the last three weeks Sanu has scored twice and posted a 100-yard game. Christian Kirk, ARZ (5-10%) — The rookie flashed major upside on a 75-yard touchdown in Week 5. He isn’t quite an every-week fantasy starter, but he could be if the Cardinals offense continues to make progress. Courtland Sutton, DEN (5-10%) — Sutton has seen seven end-zone targets this season, which is five more than Emmanuel Sanders and Demaryius Thomas combined. Tre’Quan Smith, NO (5-10%) — With Ted Ginn sidelined, Smith scored twice and topped 100 yards. But it should be noted that he only saw three targets. David Njoku, CLV (7-15%) — Njoku posted a solid fantasy day in Week 5 and is worth adding if he was dropped in your league. Austin Hooper, ATL (5-10%) — He’s far from consistent, but Hooper showed in Week 5 that he’s capable of taking advantage of a good matchup. Case Keenum, DEN (1%) — Keenum may not be long for the starting job in Denver, but he offers some upside in the short-term if you’re desperate in deep leagues. C.J. Beathard, SF (1%) — Beathard has been surprisingly good as the 49ers fill-in and is coming off a 300-yard performance in Week 5. Sam Darnold, NYJ (1%) — The rookie signal-caller flashed a nice deep ball in Week 5 with two long strikes to Robby Anderson, but consistency could be an issue going forward. LeGarrette Blount, DET (3-5%) — Sure he scored twice last week, but don’t overvalue Blount going forward. He’s a still a touchdown-dependent low-upside fantasy option. Ronald Jones, TB (3-5%) — If he wasn’t picked up last week, it’s a good idea to add Jones. He’s a sneaky bet to be the Bucs lead back going forward. D’Onta Foreman, HOU (1-3%) — Foreman has been on the PUP, which means he’s eligible to return after this week. He could immediately eat into Lamar Miller‘s workload. Josh Adams, PHI (1%) — It’s worth stashing the rookie running back with Jay Ajayi out for the season. Mark Walton, CIN (1%) — With Giovani Bernard banged up, Walton is worth tucking away in deep leagues and an upside lottery ticket. Pierre Garcon, SF (3-5%) — The veteran saw 10 targets in Week 5. He doesn’t offer a high fantasy ceiling, but Garcon will have value in deep leagues going forward. David Moore, SEA (3-5%) — He leapfrogged Brandon Marshall on the Seahawks depth chart and scored two touchdowns in the process. But keep in mind that Moore is still just the No. 3 receiver in Seattle. Donte Moncrief, JAX (1%) — The Jags wideouts have been tough to predict this season, but Moncrief is worth an add after topping double-digit targets in Week 5. Josh Reynolds, LAR (1%) — With Cooper Kupp and Brandin Cooks in the concussion protocol, Reynolds has an outside shot of seeing an increased role this week in the Rams high-powered offense. Rishard Matthews (1%) — Matthews is a free agent, but will likely land somewhere soon. However, it isn’t wise to spend too much on a player who isn’t currently on an NFL roster. Just ask anyone who drafted Dez Bryant this year. Geoff Swaim, DAL (3-5%) — He’s the primary receiving tight end in Dallas and flashed some athleticism on a catch and run in Week 5. Niles Paul, JAX (1-3%) — With Austin Seferian-Jenkins on IR, Paul is the next man up in Jacksonville. C.J. Uzomah, CIN (1%) — He doesn’t offer Tyler Eifert‘s fantasy potential, but Uzomah does have value as the primary pass-catching tight end for the Bengals. Green Bay Packers (1%) — They were one of the top streamers two weeks ago and could be again this week against a 49ers offense that surrendered five turnovers and four sacks in Week 5. Miami Dolphins (1%) — This is a sneaky play, especially considering how the Bears offense looked in Week 4. But don’t downplay the Miami defense. Through the first five weeks of the season, they’re seventh in fantasy scoring thanks in large part to 10 interceptions.